This taut, true thriller takes a deep dive into a dark world that touches us all, as seen through the brilliant, breakneck career of an extraordinary hacker – a woman known only as Alien. When she arrived at MIT in the 1990s, Alien was quickly drawn to the school's tradition of high‑risk physical trespassing: the original "hacking." Within a year, one of her hallmates was dead and two others were arraigned. Alien's adventures were only just beginning. 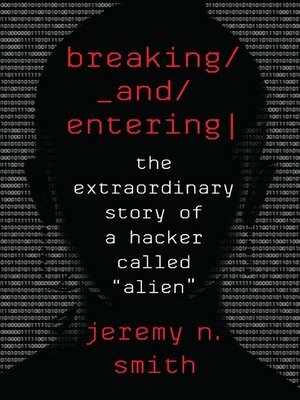 After a stint at the storied, secretive Los Alamos National Laboratory, Alien was recruited by a top cybersecurity firm where she deployed her cache of virtual weapons—and the trespassing and social engineering talents she had developed while "hacking" at MIT. The company tested its clients' security by every means possible—not just coding, but donning disguises and sneaking past guards and secretaries into the C‑suite. Alien now runs a boutique hacking outfit that caters to some of the world's biggest and most vulnerable institutions—banks, retailers, government agencies. Her work combines devilish charm, old‑school deception, and next generation spycraft. In Breaking and Entering, cybersecurity finally gets the rich, character‑driven, pacey treatment it deserves.